The Banganga Tank during the 'Banganga Festival'. Banganga or Banganga Tank, refers to an ancient water tank that forms part of the Walkeshwar Temple Complex in Malabar Hill area of Mumbai in India revered by Hinduism. The origin of the tank lay shrouded in Hindu myth, related to the Hindu god Rama. The site has a reputation for medicinal abilities and purification. Hindus on pilgrimage to the Walkeshwar Temple Complex ritually wash in the Banganga Tank before entering the temple compound. The site has become a cultural center as well as a spiritual pilgrimage site. The Tank, one of the oldest surviving structures of antiquity in Mambai, enjoys protection by the Indian government as a national heritage site. Ritual water purification has played a vital role in Hindu worship in India. The rites of spiritual cleansing and burial in the Ganges river extends to Water Tanks as well. Banganga Tank, one of only two tanks still in existence in Mumbai, has a special role to play in the life Indians. The tank has been reputed to have sanctifying, healing, and medicinal qualities. Tradition requires pilgrims to wash in the Banganga Tank before entering the Walkeshwar Temple Complex. Ten major tanks had been built by the government of Bombay to serve as water sources for the population. As is the case with other sacred waters in India, like the Ganges River, cremation and burial takes place on the sacred site of the temple and tank grounds. Famous Hindu holy men, including Sri Ranjit Maharaj (1913-2000) and his guru Sri Siddarameshwar Maharaj (1888-1936), have samadhi shrines. Legend states that Hindu god, Ram paused at that spot on his way from Ayodhya to Lanka in pursuit of the demon king, Ravana, who had kidnapped his wife, Sita. When advised to worship Shiv lingham, the legend continues that Lord Rama constructed the original lingam of sand, after getting tired of waiting for his brother, Lakshman, to bring an idol. The name etymologically derives from the Sanskrit word for an idol made of sand, Valuka Iswar, an avatar of Shiva. As the story progresses, later when Ram thirsted with no fresh water readily available (except sea water), he shot an arrow and brought Ganga over here. Hence Bana (arrow in Sanskrit) Ganga. The water that feeds the tank stems from an underground spring at that spot, despite the proximity to the sea. The Banganga also houses the 'Shri Kashi Math' of the Goud Saraswat Brahmins at its banks and samadhis of their various past heads of the Math. Saraswats, people of Aryan descent, settled on the banks of the Saraswati River. The river eventually dried up leading to the migration of the Saraswats from the plains of northern India. Though the exact dates of that migration remain unknown, the Rig Veda eulogizes the river Saraswati as huge. The area has a Hindu cremation ground which after 2003 received a makeover to house a Gas crematorium. The area still has an old Hindu cemetery consisting of samadhi shrines of various Advaita gurus, such as Sri Ranjit Maharaj (1913 – 2000) and his guru Sri Siddarameshwar Maharaj (1888-1936). Lakshman Prabhu, a minister in the court of Silhara dynasty kings in Thane, built the Tank in the 1127 C.E. Rama Kamath donated money to the Walkeshwar temple to rebuild the tank in 1715 C.E. The main temple, has been reconstructed since then, upgrading the structure with reinforced concrete during recent construction. The tank, a rectangular pool structure surrounded by steps on all four sides, has at the entrance two pillars in which oil lamps called diyas had been lit in ancient times. Springs feed the tank so its water remains sweet, despite its location only a few dozen meters away from the sea. Crews clean and spruce up the tank each year for the annual 'Banganga Festival' of Music organized by the Maharashtra Tourism Development Corporation (MTDC). The Banganga Festival takes place in January, becoming an important event in the cultural calendar of the city. In addition to serving as a spiritual pilgrimage center, the Banganga Tank has become a cultural hub, providing over the years inspiration to many artists, film and canvas. The site had been used for many film shoots before the government banned those activities in November 2007 to protect the heritage site. 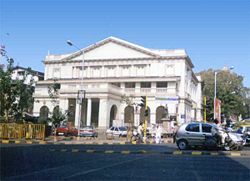 The Tank survives as one of Mumbai's oldest surviving structures. Walkeshwar Temple (also known as the Baan Ganga Temple), a temple dedicated to the Hindu god Shiva, sits in Malabar Hill neighborhood, in South Mumbai precinct of the city of Mumbai, India. Lakshman Prabhu, a Gaud Saraswat Brahmin minister in the court of Silhara dynasty Kings who ruled Thane, and the islands of Mumbai during 810 to 1240 C.E. built the temple and the attached fresh water Banganga Tank in 1127 C.E. The Portuguese destroyed the temple during their reign over Mumbai (Portuguese Bom Bahia) in the sixteenth century. Mumbai businessman and philanthropist, Rama Kamath, another Gaud Saraswat Brahmin (known in British records as 'Kamati'), generously rebuilt the temple in 1715. The main temple has been substantially reconstructed and many smaller temples have been built around the temple compound. The temple generally has crowds the month during the full moon, and at Amavasya (new moon). In the past, the Malabar pirates who used to frequent the islands during the sixteenth and seventeenth centuries visited the temple as one of their favorite places. Currently the temple site hosts an annual Hindustani classical music festival, which in 2005 featured musicians like classical singers Rajan and Sajan Mishra, and Santoor maestro Shivkumar Sharma. 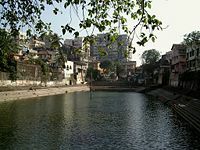 A branch of the Shri Kashi Math, a famous religious seat of Gaud Saraswat Brahmins, situates on the western bank of the Banganga Tank. Although long vanished, the city of Bombay (now Mumbai) once had many water tanks within its city limits. The tanks once served as the only source of water to the city. The names of the roads in the vicinity serves as the only testimony to their existence, which befuddles many citizens as to the original location to those mystifying relics of the past. Out of the list only the Banganga Tank and the Bandra Tank still exist today. Cowasji Rustamjee Patel built Cowasji Rustamji Patel Tank in the Girgaon vicinity in 1775. Framji Cowasji built the Framji Cowasji Tank bordering Esplanade in 1831. A plaque on a wall opposite Metro Cinema in South Mumbai constitutes all that remains of the tank. 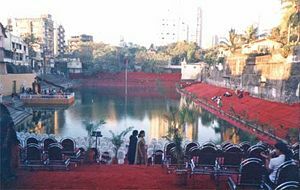 The Babula Tank sat near Grant Medical College and a pious woman named Putlibai constructed the Mumbadevi Tank. The Banganga Tank, present from the time of Rama, receives water from a natural spring despite being a few decametres from the sea shore. A rich Kokni Muslim of Village Navpada built the Bandra Tank, used for watering cattles and washing cloths. The tanks, mostly constructed in the crowded areas, had been prone to pollution. The scarcity of water, acute at that time, left the tanks to the mercy of the monsoon rains. According to the Bombay City Gazetteer published in 1909, those tanks often had very low water reservesand had to be replenished by sinking new wells. In 1846, the city faced an acute water shortage following which Framji Cowasji sank three wells in its gardens to provide water by steam machinery. Later in 1856, the city faced a severe drought, the government issuing an edict to relocate all cattle to Mahim, the periphery of the city at that time. Thousands would gather daily around the tank at Esplanade to collect water, while the government brought thousands of water drums from far off distances to empty into wells at Bori Bunder, Chinch Bunder, and Dongri. After the Vihar and Tulsi lakes provided regular water supply to the city thanks, the government declared the tanks redundant as well as breeding grounds for mosquitoes, consequently filling them in. The famous Gowalia Tank Maidan sits on top of the original tank. ↑ Destinations in Mumbai Retrieved June 23, 2008. ↑ Gowd Saraswat Brahmin Math at Banganga Retrieved June 23, 2008. ↑ Banganga cremation grounds Retrieved June 23, 2008. ↑ Banganga Crematorium Makeover Retrieved June 23, 2008. ↑ Meet the Sage Retrieved June 23, 2008. ↑ Journey to Banganga, Trilok Gurtu Retrieved June 23, 2008. ↑ Banganga, Walkeshwar history Retrieved June 23, 2008. ↑ Walkeshwar Temple History Retrieved June 23, 2008. ↑ Repairs at Banganga Retrieved June 23, 2008. ↑ Banganga Festival Retrieved June 23, 2008. ↑ Banganga at NY Times Retrieved June 23, 2008. ↑ Banganga in Pastel Retrieved June 23, 2008. ↑ Shooting banned at Banganga Retrieved June 23, 2008. This page was last modified on 11 May 2016, at 14:31.